I have over 40 recipe books and I am always on a quest to find meals to suit my fussy children – finally I have found the perfect book!! The recipes are lovely and very easy to follow. There are too many favourites to mention but there hasn’t been a week gone by since I’ve had the book that the children haven’t asked me for the cheese & onion patties. The lasagne is definitely my favourite. I have over 40 recipe books and I am always on a quest to find meals to suit my fussy children – finally I have found the perfect book!! If you’re looking for a cook book suitable for all of your family, this one comes tops for me. I bought this as a Christmas present for my daughter, a busy single mum, and she is absolutely delighted with it. 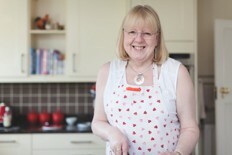 She has already made salmon fishcakes which were a resounding hit with her two little girls. WOW! This was my first reaction to this book. First…..this book is bigger than I thought and hardback which I didn’t expect. 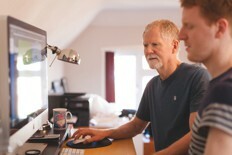 The Book…..layout is fantastic, colour pictures on just about every page. Recipes…..the first book I have bought which I can honestly say with ALL recipes using basic ingredients, practical for families. AND….. not one that I would not use. Four weeks of menu planning…..including shopping lists! What more would a busy mum want? 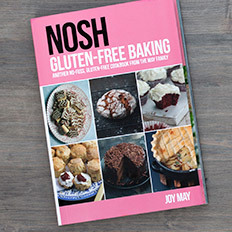 …the first book I have bought which I can honestly say with ALL recipes using basic ingredients, practical for families. AND….. not one that I would not use. Thanks for a wonderfully set out, colourful and interesting book. This is an excellent book, really practical, and packed full of recipes that you might actually make. I love cooking, and have shelves full of ‘lifestyle’ type cookbooks, which I really enjoy looking at and reading, but when I actually want to make something for the family’s dinner, this is the book that I turn to. Every recipe I have tried has tasted great and worked well. A fantastic book. The idea of writing a menu for a week and thus planning what you need to buy will also revolutionise your spending habits too. Gone are the days of a freezerful of expensive processed foods, The days of healthy, fun, real food and cooking are here! Everything about the book is brilliantly thought out, from the font and pictures to the dish difficulty rating and the “how long can I keep this…. ?” section. This book has revolutionised my eating habits! The recipes are mostly quick, use a minimum of equipment and are healthy too – packed full of good, inexpensive vegetables. One of the best things I’ve discovered is the ease with which you can modify a recipe. You can generally add and subtract according to your tastes. I never stick to the sample menus (I’m fussy), but I’ll make my own up. I bought it for my 3rd child leaving home at 16 to go to college and live in a flat. 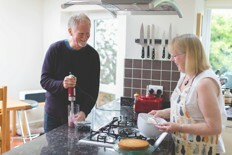 He began practicing the recipes before he left home and we all loved them. I have now bought another 3 copies, one for me and 2 for my older 2 boys already at uni. The recipes are really simple and quick to prepare and so tasty. They also are very budget minded so no fancy expensive ingredients. I am a 48 year old mother of 4 and I LOVE this book. Unlike many cookbooks there are also lots of really appealing meals-often I only find 3-4 recipes I really fancy in any cook book, but already we have had at least 15 great dishes from this book. I have been raving about it on Facebook and I know several of my friends have now also bought copies. You won’t regret this purchase I can assure you! 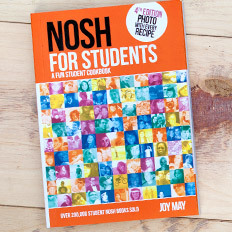 This review is from: Nosh for Students: A Fun Student Cookbook. Having been a stranger to the kitchen, I bought this book in preparation for University. It worked! I have already tried out a few dishes; tomorrow I take on tuna and hot potato salads as well as home-made wedges.Perhaps these sound simple but I would not have tried without the reassuring guidance of Ms. May! I particularly like the pricing guide for each dish and the photographs which give you a good idea about how it should look like. There is lots of variety within the book and there are different sections for different occasions and even budgets. Truly a student cook-book written specifically with students in mind, even down to measurements in ‘mugs’ rather than scales. Great advice is scattered throughout the book, including getting into the habit of deciding what meals you will have for the week. Overall, pragmatic, suitable for its purpose and a very good price. I wanted to buy a cookbook for my son who was going to uni. He had not attempted to cook whilst at home so i was worried that he would live on ready meals when he was there. I bought this cook book because it had a photograph of what the finished meal should look like and it also listed the basic ingredients and equipment that would be needed to make the recipes inside the book. It also explained what a teaspoon, dessert spoon etc was and other basic questions that my Son would probably want to ask me. I thought that buying him this cookbook would be a way of my being there without me being there! Now that he is at uni, he and his girlfriend have been using this book every day. They also send me photos of their end product and are obviously proud of their achievements! Purchased for my son going to Uni who has never cooked more than beans on toast! 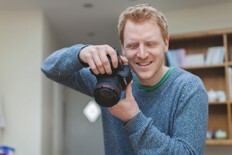 Brilliant book with lots of photos and ‘student friendly’ food – fancy a lot of them myself. Good simple and clear instructions on how to cook, no waffle, clear and to the point. 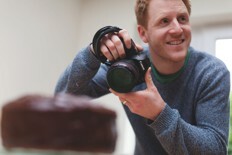 Great book compared to many that dont show the end result of the food in a photo! Well worth it and my son – more to the point – thought it was excellent. This book is a must-have for students and non-students alike. My other (more expensive!) 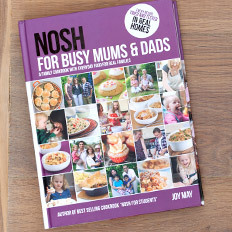 recipe books are getting dusty as I find myself constantly referring to Nosh for Students for realistic, affordable and truly delicious recipes that are easy to reproduce in ‘real life’. I find the simple, practical approach actually lures me into being more adventurous with cooking than I have been using other more daunting ‘haute cuisine’ books. A great confidence builder! – I’ve referred to the opening section of this book again and again as it sets out general rules for keeping food, cooking and roasting times. – The ingredients are actually things I buy! – It just feels nice! Clearly well thought out – logical lay-out, great pictures. – Makes you feel hungry just flicking through as every good recipe book should! 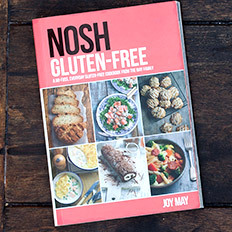 The Nosh range is getting better and better! More please! At the age of 53, I am definitely not a student – I bought this book because I am vegetarian and live alone. It’s extremely difficult to find recipes that cater for one – most start at 4 portions. I absolutely LOVE this book because it doesn’t demand great cookery skill, doesn’t expect you to own loads of equipment & most of the main ingredients (pasta, rice etc) are what I normally stock in my food cupboard. The recipes are interesting and I love working out a weeks recipes in advance (something which Joy suggests at the beginning of the book) so that I use all perishable items and don’t end up wasting food. The recipes are quick, easy, cheap and tasty and I love coming home from work each day and cooking my evening meal. I shop at Asda and find that shopping there and sticking to my weekly meal plan has considerably reduced my food bills & I am eating a lot more healthily (& happily!) than I was previously. , and the Cheesy Rice & Spinach Slice. I have made all the soup recipes & they are absolutely brilliant particularly the Apple & Cashew Soup. Also the Jacket Potato with Egg Mayonnaise & Sweetcorn has become a Saturday lunchtime favourite – such a simple idea – cheap & nutritious but looks and tastes great. One little tip for people making the Savoury Cheesecake – use flavoured Philadelphia – the one with chives is brilliant but I’m planning to make it with the sweet chilli-flavoured cheese next time. Most of the recipes are extremely versatile – I would suggest cooking from the recipe the first time then you will know what tweeks you can make (I don’t like tomatoes so use other vegetables & mushroom or celery soup in place of tinned tomatoes). 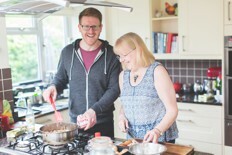 I have just lost four stone and am now trying to maintain a normal, healthy weight – I serve most of the meals with a small side salad and the portions are about right for me – in the non-vegetarian book the recipes which are marked as 2 > 3 portions are definitely 3 portions – I always end up freezing the third portion. Any small criticisms I have of this book are that the weekly meal planners do not include all the items needed (e.g. the one in the front of the book doesn’t include lentils which are needed for the bolognese) but otherwise I think the book is marvellous and I have just bought the non-vegetarian version which has a vegetarian chapter as well as lots of recipes which use sausages and therefore vegetarians can make those dishes as well using their favourite vegetarian bangers (I like the Cauldron ones best). I have already make the Chocolate Mint Slice from the baking chapter – WARNING! all your family & friends will demand the recipe for this. I made it for my work colleagues & by the time I had made a cup of tea & returned to the office it had disappeared so I didn’t get any! I’m going to make a coffee version next week and use white chocolate for the top, sprinkle it with a crumbled-up Cadbury’s Flake & call it Cappuchino Slice! My sister-in-law was so impressed by this book that she bought it for my neice when she started uni. 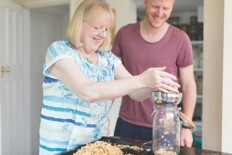 All the youngsters in my family enjoy looking at the recipes and enjoy eating the food too! 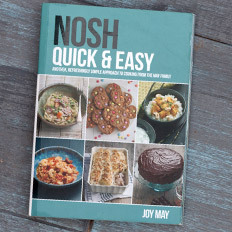 Many thanks, Joy, for a brilliant book – I’m sure it’s brilliant for students but for us older ones who are by themselves, are not great cooks but want cheap, nutritious, interesting meals, you can’t do better than buy this book. Please, please, please keep the books coming and don’t just aim them at students – there are plenty of people who want to cook their own meals, are on a tight budget, don’t have amazing cookery skills/equipment and need something like this to get them started and in these times of recession we need more books like this. I was that child who ate one brussel sprout and then looked appealingly at my mother to see if I had to eat the rest. I don’t specially like vegetables.To me, their sole function is to make meat look better. What, then, would be the point of someone like me owning this book? Well, there are several reasons. Firstly, the recipes are really tasty and made me actually appreciate that vegetables can be eaten instead of meat. Secondly, the recipes are healthy: everyone, at some point, goes on a health bender and thinks he should eat more vegetables. And lastly, it is inevitable that you will eventually invite someone round for dinner who is a freak – I mean vegetarian. It is therefore useful to have something like this up your sleeve lest you have nothing to offer them but a juicy stake, and they unleash their freakish vegetable-fuelled brand of kill rampage upon you and your fellow diners (I’ve seen it happen – it’s not pretty). Good book. Buy it. This book is great for first time cooks, the recipes are easy and quick to do giving a great indroduction to cooking! But it is also great for those who wish to expand their hoizens on vegetatian food (even if your a meat eater) or who have just started to be vegetarian. This book gave me (and still does) 6 months of new and exciting recipes almost every night! I have started to use many new ingrediants and ways of cooking food that i won’t have done before. My favourite was the Spicy Chick Peas, roasted pveg and pasta, spag bol, mago and noodle salad PLUS lots more! It is a great way for some to be indroducted to both cooking and veggie food! It also has pictures but not stylised so much that its almost impossible to get it to the same standard like so many cook books! So what you make achually looks like it does in the picture! 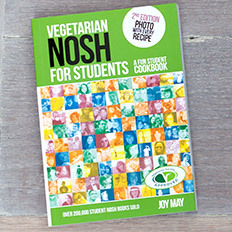 I would also recommandard getting the Nosh 4 Students as it also has an extentise supply of Vegartians recipes I looked through it in a shop and a majority of the recipes were veggie or able to be adapted to be veggie so worth buying!! I got this book recently and think it is amazing! I decided to start at the back with the ‘comfort food’ and ‘sweet days’, definitely a good place to start! I think the Chocolate and Rasberry Torte is delicious, I made it for a party and had soooo many compliments as to how good it tasted! 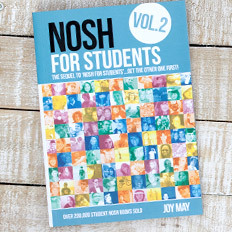 We used Nosh 4 students (when we were students) and this book follows the same easy to use pattern but with some slightly more complex and sophisticated ideas. The ease guide also helps me to know if I’m going to need a trial run before attempting it with guests! It’s so clearly set out with all the helpful information you need. Whether you can cook or just would like to be able to I would highly recommend this excellent book! I may not be a student any more but that doesn’t mean I have loads of money! The thing I love most about this book is the fact that every recipe comes with an estimated cost. That has meant that I can choose the cheaper recipes in the weeks leading up to pay day, an absolute necessity in my household. The added extra of knowing how long recipes should take means that planning for days when time is not my friend is easy. My favourite section is the one pot cooking section as I hate washing up with a passion and I can use my new slow-cooker put the meal in and walk away. 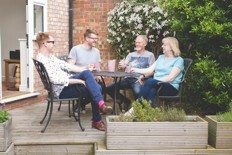 The cook school builds one the skills that most students have learnt during university and the ideas for a herb garden are simple and well laid out. I love the photos as they give you a great idea what the meal should look like and how you can best present it for friends. I’m really looking forward to throwing a dinner party!